is manufactured with either 2x6 or 2x4 lumber. The Basic frame kit type includes cut-to-fit blocking within each triangle. The blocking provides additional support for triangular panels. The Basic frame kit also includes pre-assembled vertical trapezoids. There are ten vertical trapezoids between ten triangles on the lower perimeter. The vertical trapezoids allow for the framing of doors and windows. the smooth sculpted look of painted sheetrock on the interior. exterior facing and interior facing triangular panels. You might say that T-Beam frame kit uses the force of gravity to help you. Similar to the way a suspended ceiling holds rectangular tiles in a commercial building. Each T-Beam strut is comprised of two boards joined lengthwise. The flat side of a sanded and routered 2x4 faces to the inside of the dome ceiling. The other length of lumber (not the trim) can be either a 2x6 or a 2x4. The T-Beams are cut on the ends with double compound angles forming struts. on the lower perimeter with an interconnected triangulated T-Beam lattice above. patterned ceiling and add a woodsy look to the interior of their dome home. by eliminating the need to work upside down on the interior of the dome ceiling. attractive three dimensional triangulated lattice of exposed 2x4 wood trim. *Choose only one of two available EconOdome frame kit types, Basic or T-Beam. *Then choose either 2x6 or 2x4 construction. Note: All 2x4 EconOdome T-Beam construction was used effectively in the Arctic. Insulation sheeting installed outside the building frame is more effective as it also insulates the building frame. consists of struts made by attaching two boards together lengthwise. This manufacturing procedure straightens both boards and creates a very strong T-Beam. that stitch all connections securely. are included with every frame kit. ten pre-assembled trapezoids that will stand vertically at the lower perimeter. *Optional perimeter riser walls are required for most dome home sizes and designs. The height of your riser wall will vary depending upon your dome size and design. Please consult your plans or our office to determine your riser wall height. *Extensions, to accomodate conventional doors and windows are not necessary. *Attractive and functional optional canopies may be added over doors and windows. *All custom skylight framing within triangles is included at no extra cost. *With both frame kit types: optional pre-cut exterior panels are available. *Both frame kit types employ methods to avoid condensation and mold issues. are available for the T-Beam frame kit only. *We encourage you to save money by cutting your own triangle shaped panels. how to efficiently cut triangle panels for any size EconOdome frame kit. ventilated exterior sheathing made with two layers of OSB and OSB spacers. cut from 60mil SureWeld TPO manufactured by Carlisle. the 130 large lapping TPO shingles are glued to the exterior panels at the factory. digital heat gun and a two inch wide heat tolerant silicone roller. This roofing process makes a durable, waterproof and wind tolerant exterior surface. TPO shingles are available in three colors: white, tan, & gray. The 120 Pre-Cut Interior Triangle Panels Kit are for T-Beam frame kit only. Total R-Value for the all 2x4 T-Beam Roof Section is R-43. Total R-Value for the 2x6 T-Beam Roof Section is R-53. following a storm. Also the ventilation space keeps your home cooler in the summer. The ventilation space is created by installing OSB spacers between two layers of OSB. We want ensure that your dome home is designed to be durable and repairable. We call our Faze Change Produx, "EconOdome Kits" for a reason. built with EconOdome Kits to be very popular in the future. And we want EconOdome Kits to help you build an awesome dome home right now. that are used to complete the top of the EconOdome frame kit, made with 2x4 lumber. the top of the dome is framed 2x4 lumber. A "Level Loft Ledge" is created because 2x6 lumber is thicker than 2x4 lumber. And this two inch wide "Level Ledge" can be used to support the second story loft level. This inovative feature allows you to more easily construct a loft level within a dome. 120 precut & laminated interior facing R-20 sheetrocked triangle panels. the dome structure is enclosed. for the three largest sizes only. The Loft Ledge kit includes the perimeter riser walls. please contact our office for exact pricing of the Loft Ledge frame kit. for the 38.5' dia. Basic EconOdome frame kit including attached TPO shingles. with either the Basic or T-Beam EconOdome frame kit. in order to exceed the standard R-38 "roof insulation" building code requirement. 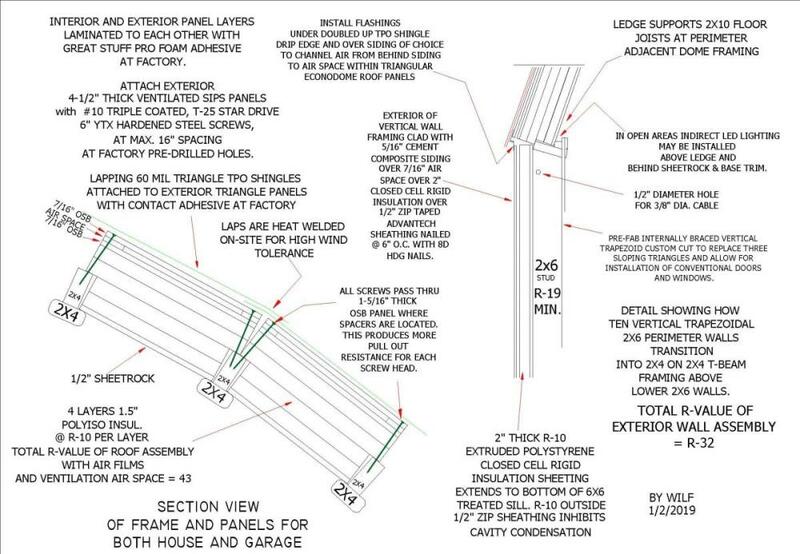 Labor-saving "Loft Ledge" T-Beam EconOdome frame kit costing $15,000. + pre-fabricated 42� high perimeter 2x6 riser wall. With the "Labor Saving" T-Beam frame kit you will need both the 'Exterior' and 'Interior' panel kits. Interior triangle panels kits for the 38.5' dia. dome include 210 panels to fill 120 triangular frames. The 90 largest framed triangles are each filled with two separate interior panels so the panels are lighter and easier to handle. The Interior R-20 panels consist of 3" rigid insulation with 1/2" sheetrock laminated on the interior side... cost..$6,000. The 100 largest framed triangles are each filled with two separate interior panels so the panels are lighter and easier to handle. The Exterior R-23 ventilating panels consist of 3" rigid insulation laminated to a triple layer of OSB....cost..$6,000. Additional Cost to have pre-cut 60mil SureWeld TPO shingles bonded with contact adhesive to the 230 exterior panels is $5,000. 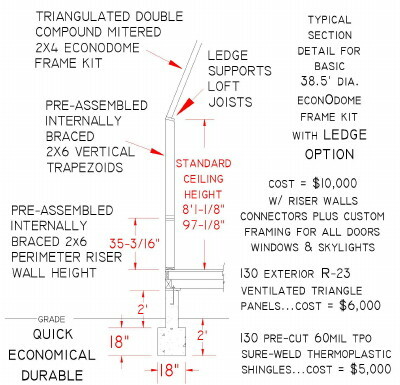 Total cost for the 'Labor Saving' Loft Ledge EconOdome T-Beam Kits for the 38.5' diameter dome home listed above is��$32,000.